Room S–3510, 200 Constitution Avenue NW. We are writing to express our support for the U.S. Department of Labor’s (DOL’s) proposed rule implementing Executive Order 13706, Establishing Paid Sick Leave for Federal Contractors (“the EO” or “the Order”). Our research indicates that paid sick leave for federal contractors could improve job quality for hundreds of thousands of workers. Our estimates suggest that between 694,000 and 1,053,000 employees of Federal contractors may directly benefit with additional paid sick leave, including an estimated 450,000 to 775,000 who currently receive no paid sick leave. The federal contract workforce— those workers paid with Federal dollars but employed by private businesses— is swelling in size. Although the Federal government does not collect data on Federal contract workers, using the General Services Administration’s Federal Procurement Data System and the Employment Requirements Matrix from the Bureau of Labor Statistics, we estimate that Federal contract workers have growth from about 1.4 million in 2000 to nearly 2.0 million in 2015. While the outsourcing of government work through Federal contracts is often done in the name of cost-saving, unfortunately, when such savings do occur it is less likely to accrue from greater efficiency in provision, but instead stems from the willingness and ability of private contractors to push down wages and benefits for employees below what they would receive in the public sector. Because of the nature of these contracts, the Federal government is in the position to determine that contractors that wish to do business with the federal government must comply with labor standards that the government sets, including minimum wages and benefits. In 2014, Executive Order 13658 set a minimum wage for federal contractors, which help ensure that taxpayer dollars were used to protect these workers to counterbalance the depressing effect contracting out can have on the incomes of people who work under contracts, and do not have the benefit of direct federal employment (Edwards and Filion 2009). Executive Order 13706 has the similar promise of helping to protect these federal contractors and give them the ability to earn paid sick time to care for their own medical needs, a family member’s medical needs, or for purposes related to domestic violence, sexual assault or stalking. Evidence from the private sector and the states and cities with paid sick leave laws demonstrates that paid sick days improve employee retention, reduce workplace contagion and injury, and increase productivity. The cost savings associated with paid sick days serve the purpose of the Executive Order to promote economy and efficiency in federal contracting. Furthermore, as with existing state and local paid sick leave laws that are very similar to the proposed Order, the proposed rule will benefit workers, their families, and public health. We have prepared three sets of estimates on the number of federal contract workers who may receive additional paid sick leave based on the Executive Order. All estimates rely on the General Services Administration’s Federal Procurement Data System and the Employment Requirements Matrix from the Bureau of Labor Statistics. Using these in combination, we determine that there are 1,987,000 private sector contract workers directly employed in industries receiving federal contract dollars. All of our estimates also utilize the National Compensation Survey, public tables and unpublished data provided to us by the Bureau of Labor Statistics, to calculate the share without access or without sufficient access. To some extent our estimates provide a lower bound because the data only allow a cut-off around five paid sick days available, a lower number than the proposed Order would require. For full methodology of how we arrived at all of the preliminary and final estimates, please see the methodological appendix attached. A summary of our findings are listed in Table 1 below. Please feel free to contact us for additional information. Our first estimate uses estimates of paid sick days access and number of days from the National Compensation Survey for all private industry workers. Here we find that a potential 1.05 million federal contract employees may either have no coverage or insufficient coverage and would stand to gain additional coverage under the proposed Executive Order. Our second estimate makes the additional assumption that firms that contract with the federal government are likely larger than average – contracting with the federal government requires administrative resources and record-keeping that smaller firms are likely to lack. Again, we use public tables from the NCS for coverage rates of firms larger than 100 employees. These estimates are shown in the second row of Table 1. The total number affected under this assumption is 827,975, a number very much in line with DOL estimates of the number of employees who may be provided additional paid sick leave under the Executive Order (their estimate is 828,000). Source: EPI analysis of Bureau of Labor Statistics unpublished National Compensations Survey Data, Employment Requirement Matrix, and General Service Administration Federal Procurement Data System. The third estimate in Table 1 takes into account the fact that federal contracting firms may have a different sectoral distribution than the private sector in the economy at larger. Here, we rely on unpublished tables supplied to us by the BLS on coverage and coverage amount at the three-digit industry level. For issues relating to some imputations in the data that were required, please refer to the methodological appendix attached. The third row reflects the sum of employees in each of the disaggregated industries, and the final estimate here suggests that 693,888 employees may gain additional coverage under the paid sick days Order. Table 2 below aggregates our 3-digit data to the 2-digit industry level and details the number and shares of workers in each category who are likely to gain coverage under the Order. The most heavily affected sectors include retail trade, administrative support waste management and remediation services, accommodations and food services, and arts, entertainment and recreation. All of these sectors will potentially see expanded paid sick leave that will cover more than half of their federal contract employees. We strongly support the proposed rule. Paid sick leave is a key labor standard that too many American workers lack. Addressing this problem comprehensively will require legislation, but in the meantime it is wholly appropriate for the executive branch to use its power to set labor standards for federal contract employees that will model how decent employers act. And while this rule is not a comprehensive solution to our antiquated failure to provide paid sick leave to American employees, it will make life better for hundreds of thousands of contract employees and their families, across nearly every major sector of the U.S. economy. The federal government does not collect data on the number of contract workers, who these workers are, or their compensation. In order to estimate the characteristics of these workers, we looked at private sector workers in the industries to which federal contract money flows. The share of employees being paid by federal government funds who work in the private sector has been estimated to have grown to forty-three percent in recent years (Edwards and Filion (2009)). To estimate the number workers covered by federal contracts who would be covered under the proposed paid sick leave executive order, we combined federal procurement data and Bureau of Labor Statistics, National Compensation Survey (NCS) data. Using the dollar value of the contract and the industry to which the dollars flowed, we were able to estimate the number of workers employed and then the proportion of those workers who would have access to paid leave. Contract data came from the Federal Procurement Data System Next Generation (FPDS-NG) FY2014 Federal Procurement Report. Each year, the FPDS-NG offers a breakdown in Federal Contract Actions and Dollars, divided by Executive Department, Agency, state, or North American Industry Classification System (NAICS) code in the Federal Procurement Report. This means that we have data on the dollar amount of each action, the location of the work performed, the contracting agency, and the industry in which it was spent. In 2014 total dollars spent was $568,598,069,904, and over 100 sectors received contract dollars. To estimate the number of jobs on each contract, we matched the dollars spent by NAICS code in the FPDS-NG to the nominal dollar-based Domestic Employment Requirements Matrix for 2014. The output was the number of jobs created in each industry from federal contract spending. For example, if an industry created two jobs for every million dollars of sales and received $50 million in federal contracts, that translated to 100 jobs. Using the procurement data for the 96 sectors used, we found that there were 1,986,504 federal contractors in 2014. We removed the Public Administration sector (sector 92), as well as NAICS codes 513 (Broadcasting and telecommunications), 514 (Information services), and 516 (Internet publishing) from this analysis because these industries were not included in the Domestic Employment Requirements Matrix. We do not think this biases our overall results unduly because the total dollars for all of these industries are a small share of the overall total procurement dollars. For NAICS code 113 (FORESTRY AND LOGGING), we use a weighted average of the individual forestry and logging employment requirements and the number of employees in forestry and logging to determine the labor input per dollar spent. For the construction sector (Sector 23) and both the trade sectors (Sector 42 & 44), we applied the overall sector employment requirement to all of the sub-industries within that sector. With the number of jobs created allocated to BLS-coded industries, we used NCS data to determine a large-firm average as well as a 2-digit NAICS code average of the number of employees that would be affected by this paid executive order. The NCS-Benefits data provides us with two key variables: the share of workers by industry that have access to paid sick days and the share of workers by industry that have less than five paid sick days (insufficient coverage), after 1 year of service. Of the 96 sectors we incorporated in this analysis, 76 percent of industries reported NCS access data and 64 percent of industries reported less than five days of paid sick leave data. We applied industry averages when applicable to missing data points in a sub-industry, and the overall average to industries in which we were missing NCS data for the entire industry (Agriculture). This methodology assumes that firms with government contracts are more likely to be larger firms, which tend to provide better access to paid leave than their smaller counterparts. We consider large firms to be all firms with 100 or more employees. Thus, we created a large firm ratio, to determine how many employees would likely receive paid sick leave benefits under this new Executive Order. The large firm ratio is a simple ratio of those who do not have access to sick leave at larger firms to the overall lack of access among firms of all sizes. We think this correction is necessary so as to not overestimate how many workers will have expanded access to sick leave under the new DOL rule. Insufficient coverage large firm ratio = Share with insufficient coverage * Large firm ratio Share with insuff.cov. Number of workers with insufficient coverage = Total employees * Large firm ratio Share with insuff.cov. Using the same methodology above we were able to construct sub-industry 3-digit NAICS estimates and aggregate up to 2-digit industry estimates. 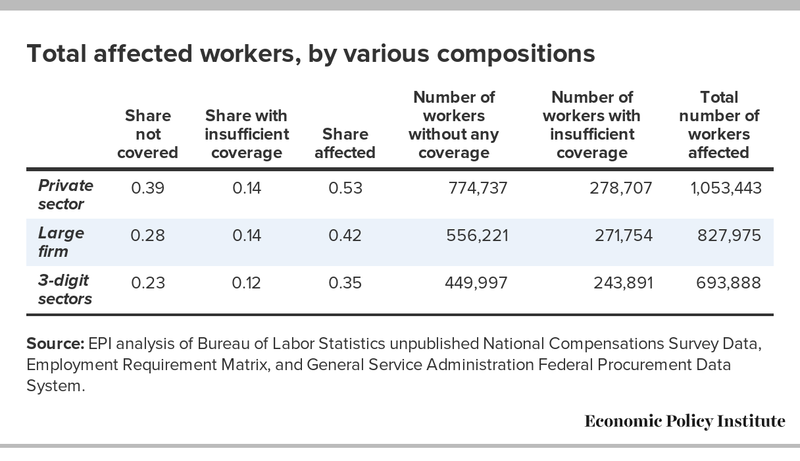 It is important to note that the calculation for the number of workers with insufficient coverage was slightly different at the 2-digit level. This calculation can be found below. Number of workers with insufficient coverage = Total employees * Share not covered * Share with insufficient coverage * Large firm ratio Share with insuff.cov. Bureau of Labor Statistics (U.S. Department of Labor), Employment Projections. 2014. Employment Requirement Matrix. Bureau of Labor Statistics (U.S. Department of Labor), National Compensation Survey. 2015. Unpublished data. Edwards, Kathryn and Kai Filion. 2009.Outsourcing Poverty: Federal contracting pushes down wages and benefits. Economic Policy Institute, Issue Brief #250. General Service Administration. 2016. Federal Procurement Data System. U.S. Department of Labor (DOL). 2016. Paid Sick Leave for Workers on Federal Contracts: Overview of Proposed Rule.